Mercy High School rejoices for 2019 Heart of Mercy Award recipients Maggie Dwyer '19 and English Teacher Mr. Steve Morgan who live out the values of Human Dignity, Service, Justice, Mercy, and Option for the Poor. Here's to these super staff who achieved a milestone in years of dedicated service to Mercy High School! Val/Sal Candidates - Hats off to the following seniors who were selected as Class of 2019 Valedictorian and Salutatorian Finalists! This distinction considers not only academic record but also leadership, service and extracurricular involvement. Congratulations to the following students who were inducted into the National Honor Society and commended for exemplary scholarship, character, leadership and service! College Board National Hispanic Recognition Program - Congratulations to Genesis Gonzales '20 who scored in the top 2.5% on the PSAT/NMSQT among all Hispanic and Latino test-takers in the region. She is invited to participate in the National Hispanic Recognition Program administered by College Board. 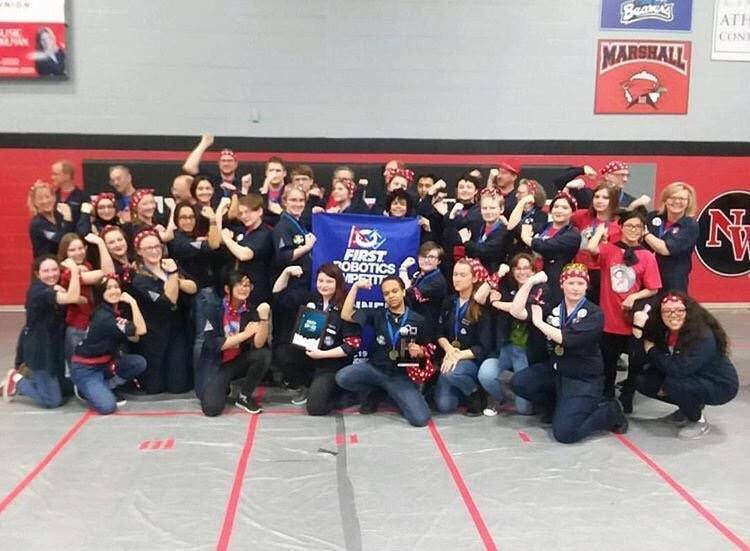 The Riveters Mercy Robotics Team brought home a blue banner with a 1st place finish at the FIRST Robotics Jackson District Event. The Riveters finished with a 11-1-0 record after 80 qualifying matches in 2nd place. They went 2,0, 2-0, 2-0 in the quarterfinals, semifinals and finals and beat the 1st place alliance to become the District Event Winner with a 1st place ranking. The team also earned the Engineering Inspiration Award and are currently ranked 13th in the State! 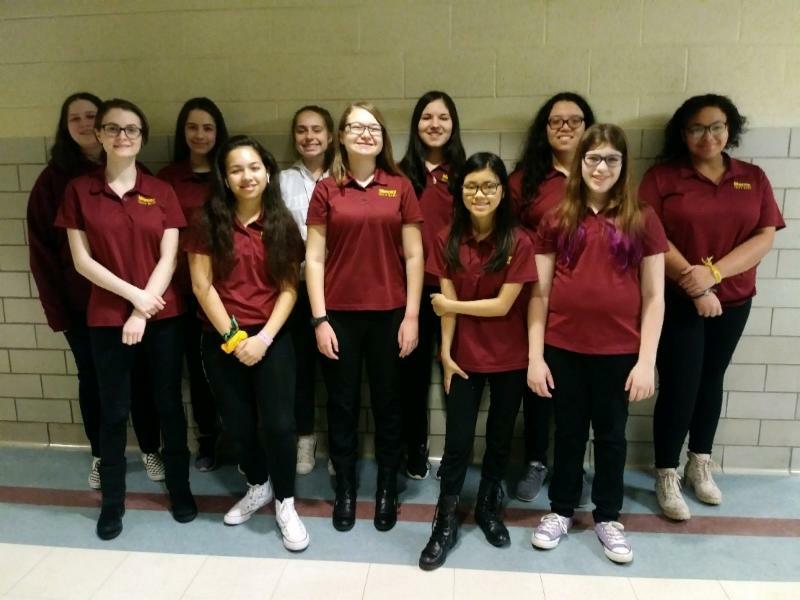 Plus...check out this cool video feature about our amazing Robotics Team from "FIRST Robotics Women in Stem powered by DTE." 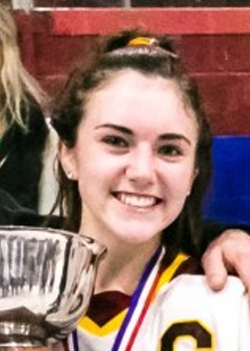 Congratulations to Libby Bartels '19 who was named the 2019 Miss Hockey Michigan! Libby also received the prestigious Hobey Baker High School Character Award! The Hobey Baker award honors high school hockey players who exemplify the ideal that "Character Builds Excellence" and recognizes outstanding individual performance on and off the ice. 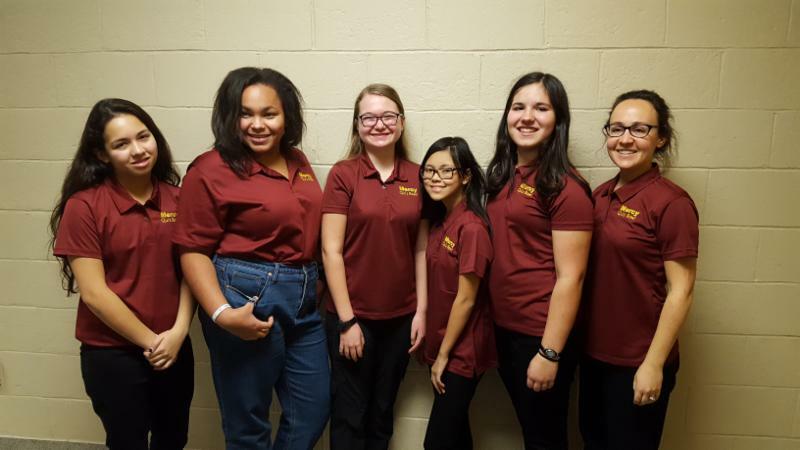 Mercy Quiz Bowl sent 3 teams to the NAQT State Championship, held at the University of Michigan. Former Coach Mrs. Ann Lusch watched the 3 teams over 11 rounds of play. After extensive competition, Mercy A placed 7th in the state, Mercy B placed 19th, and Mercy C placed 22nd. Very impressively, junior Rachel Vinarcik finished 7th individually--the highest finish for any Mercy student in recent years--in a field of 100 competitors. We would like to especially congratulate sophomores Christina Wollenhaupt and Raquel Segars, who earned their varsity letters at this tournament! You can view the tournament statistics here. Click here to view the 2018-19 Semester 1 Honor Roll. Good work, ladies! Congratulations to the 17 students from Mercy's Art Department who won 28 awards in this year's Regional Scholastic Art Awards competition. Several Mercy students won gold keys (first place) and their pieces will compete in New York for national awards in March. These students are: Avalon Barr (one gold key in drawing), Sophia Bellisario (one gold key in photography), Lili Omilian (one gold key in photography), Sojourner Posch (one gold key in mixed media), Aja Underwood (one gold key in digital art), and Katie Wildern (two gold keys in digital art and one gold key in drawing). CLICK HERE TO VIEW GALLERY OF ARTWORK. The College for Creative Studies sponsors the Southeastern Michigan Art Region, which, this year, received nearly 6,300 individual entries and 229 senior portfolios from students in Lenawee, Livingston, Monroe, Oakland, Washtenaw and Wayne Counties. Jurors selected 1109 individual category works to receive gold key, silver key, and honorable mention awards. 16 gold key portfolios were selected from 229 submitted. The Gatorade Company, announced Jess Mruzik of Mercy High School as its 2018-19 Gatorade Michigan Volleyball Player of the Year. Mruzik is the second Gatorade Michigan Volleyball Player of the Year to be chosen from Mercy High School. 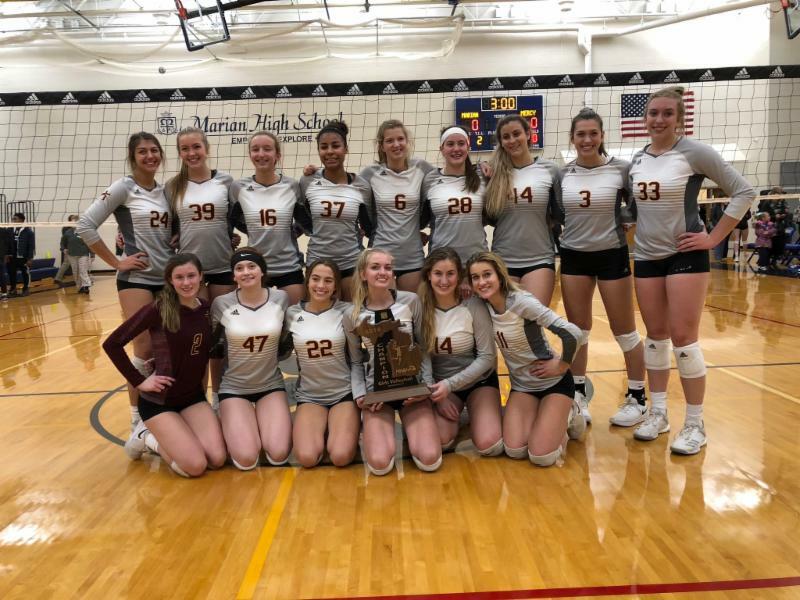 The award, which recognizes not only outstanding athletic excellence, but also high standards of academic achievement and exemplary character demonstrated on and off the field, distinguishes Mruzik as Michigan’s best high school volleyball player. Now a finalist for the prestigious Gatorade National Volleyball Player of the Year award to be announced in January, Mruzik joins an elite alumni association of state award-winners. The 6-foot-1 junior outside hitter recorded 420 kills and 165 digs this past season, leading the Marlins (52-3) to the Division 1 state semifinals. Mruzik also posted 65 service aces and 50 assists while compiling a kill percentage of .514 and a hitting percentage of .417. The captain of the 2018 USA Volleyball Youth National Team, Mruzik missed 12 matches for Mercy at the beginning of the season while competing at the NORCECA Continental Championships in Honduras. The United States won the tournament and Mruzik was named MVP. 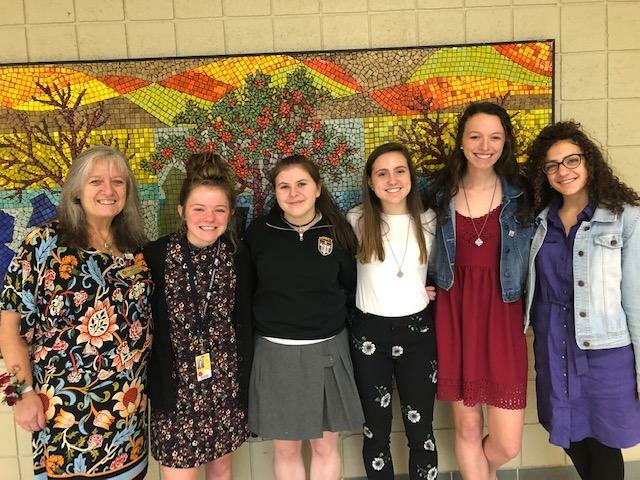 God Bless new Youth Mercy Associates Maggie Dwyer, Isabelle Fanning, Angela Rea, Anna Rimatzki and Alexis Dickie who made her re-commitment at last month's Foundation Day Mass commissioning ceremony. 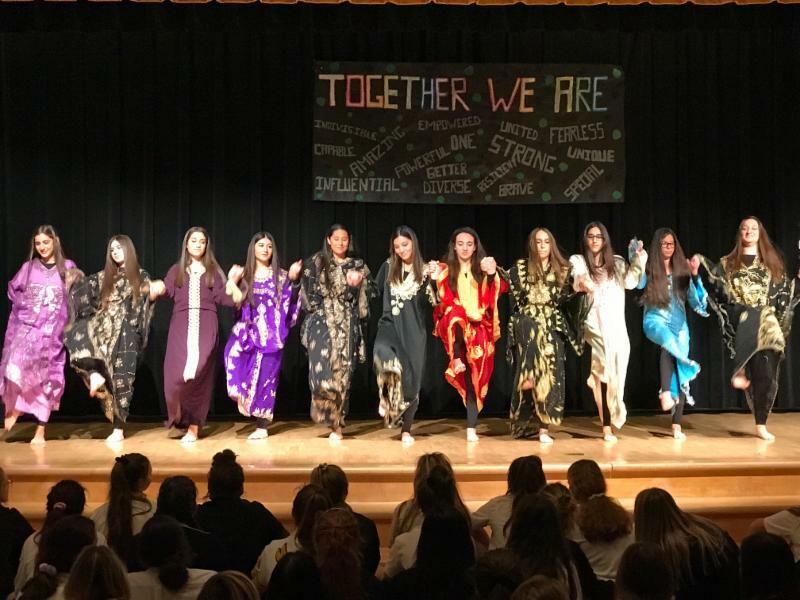 Human Relations Council proudly presented Ethnic Bazaar 2018 "Together We Are" on Friday, November 30th in the Drama Studio. Ethnic Bazaar is a long standing Mercy tradition which highlights our diversity and unity through song, dance, prayer, food, and fashion. Congratulations and thank you to all of our wonderful performers. Together, We Are Mercy! Wow! Kudos to Katherine Hutter '20 who was named the MaxPreps Semper Fidelis Athlete of the Month! This award is only given to one male and one female athlete a month throughout the entire nation. Katherine is the first student athlete ever awarded from Michigan! Check out the article "Going the Distance" MaxPreps announcement here. View video segment about Katherine here. Way to go, Francesca Schena '19 was named a School Winner in the 2018 Wendy's High School Heisman competition. Congratulations to Colleen Thomson '19 who was named a Semifinalist in the 2019 Coca-Cola Scholarship Program! Students were selected from among 200,000+ applications for outstanding commitment to both their communities and schools. On Saturday, November 17, Mercy Quiz Bowl traveled to East Lansing to compete in the MSU Harvard Mirror Tournament. Mercy finished 8th out of 24 teams, with a 7-4 record. Junior Rachel Vinarcik finished 6th overall in a field of 110 competitors, earning 580 points for the team and placing highest for any female competitor. Lili Omilian placed 30th overall, earning 220 points for the team. Caitlyn Begosa placed 58th overall, earning 165 points. A special congratulations to freshman Caitlyn Begosa, who earned her varsity letter at this tournament! You can view all tournament information here: https://stats.neg5.org/t/4rPn3QFqD/msu-harvard-fall-2018/team-standings. On Saturday, December 1, Mercy sent 2 teams to the annual UM Autumn Classic Tournament in Ann Arbor. 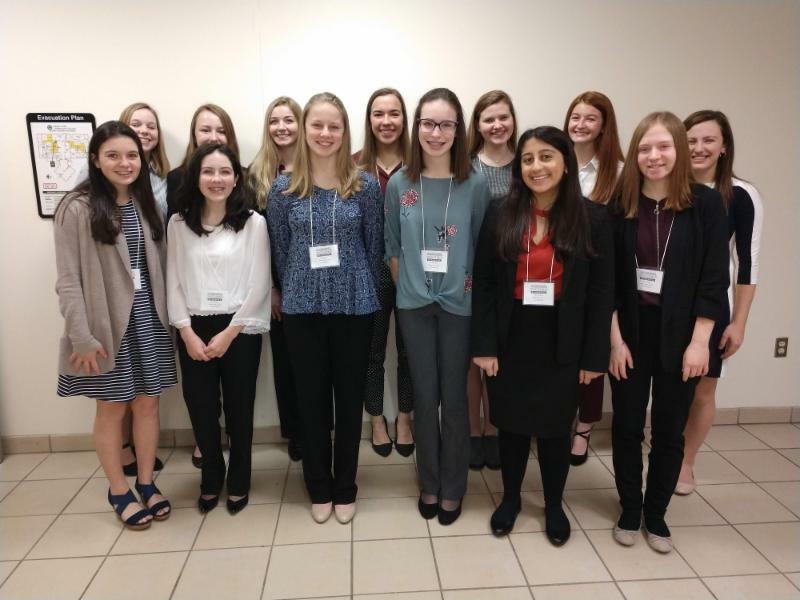 After 10 rounds of academic competition, beginning at 9 am and ending at 5 pm, the Mercy A team of Grace Kruse, Lili Omilian, Sophia Tesic, and Rachel Vinarcik finished 7-3 overall. Juniors Lili Omilian and Rachel Vinarcik co-captained the team, leading them to an impressive finish. The Mercy B team of Caitlyn Begosa, Emma Dismondy, Lydia Walsh, and Christina Wollenhaupt finished 3-7 overall. Freshman Caitlyn Begosa captained the underclassmen team, in which all members answered questions at the "power" level. Junior Rachel Vinarcik placed 10th individually in a field of approximately 130 competitors from all over the state. A special congratulations to sophomore Sophia Tesic and sophomore Lydia Walsh, who earned their varsity letters at this tournaments! Did you know Mercy has been Catholic League Swimming & Diving Champions 51 of the last 52 years?! 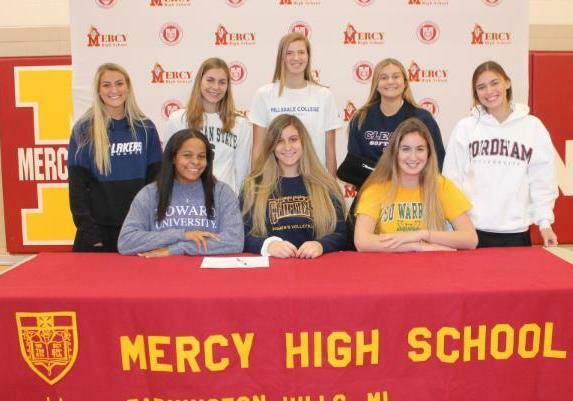 The Mercy Athletics Department hosted an event to celebrate all senior athletes committing to play a sport next year at the college level. We are so proud of our Marlin college bound athletes! 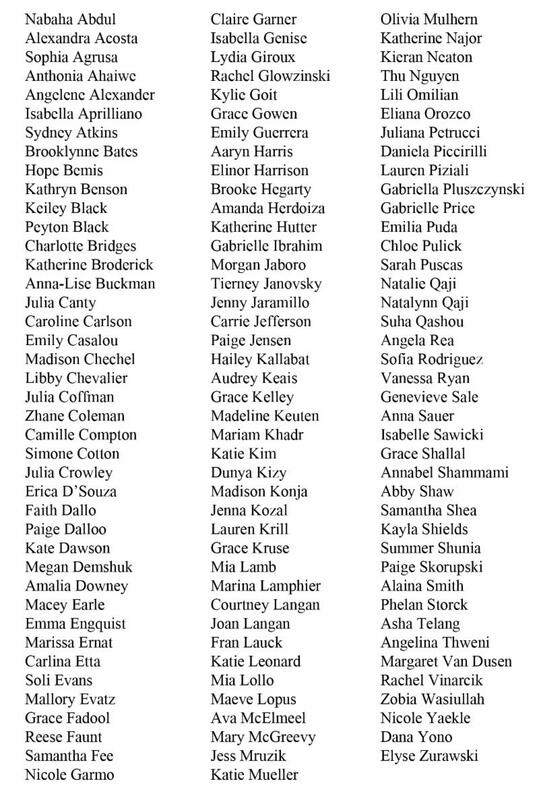 Congratulations to these talented Mercy seniors. Maddie Benoit: Volleyball, Wayne State University; Sarah Cassidy: Softball, Cleary University; Courtney Connolly: Swimming, Howard University; Annette Dombrowski: Swimming, Michigan State University; Ella Loussia: Volleyball, Canisius College; Alexa Morello: Soccer, Fordham University; Sarah Smolinski: Soccer, Grand Valley State University; Emily Susitko: Volleyball, Hillsdale College. Values in action! 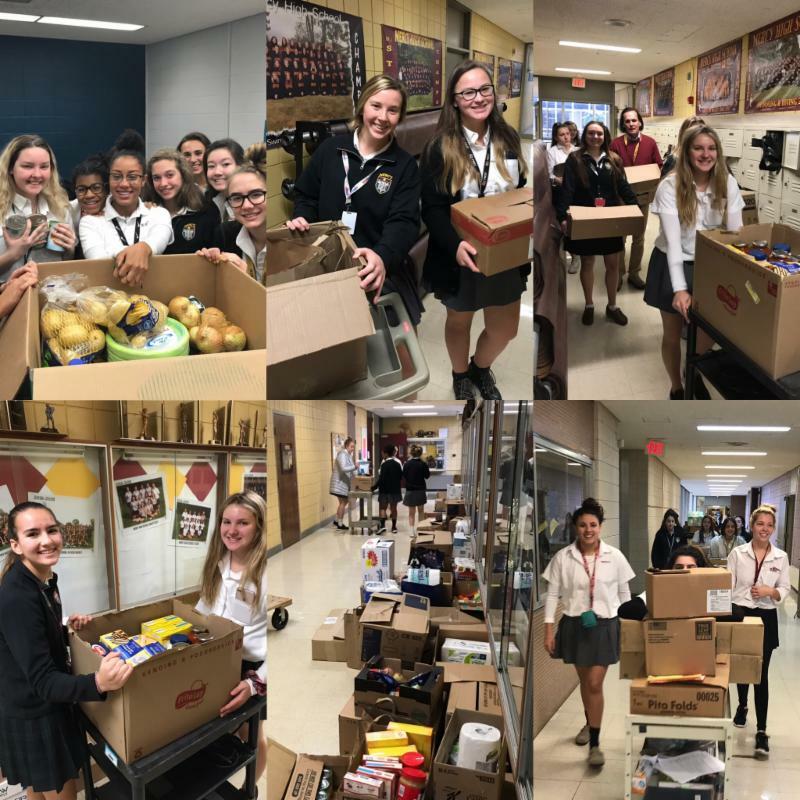 Mercy joined hearts and hands to help provide food and donations to Metro Detroit senior citizens in need for our annual Focus: HOPE food drive. We give thanks for our 30+ year partnership with Focus: HOPE and are proud to be their largest food donor during the holiday season. Each year, the Executive Board of the Michigan World Language Association nominates candidates for the Barbara Ort-Smith Award. This is the most prestigious award a professional in the field of world languages can receive in the state of Michigan. The award honors those who have shown a strong commitment to the profession, manifesting itself in leadership and the promotion of excellence in world language education. The first recipient of this award was Barbara Ort-Smith in 1988. She served as the first Foreign Language consultant in the state of Michigan. Joyce Smetanka Campbell received her BA from Michigan State University in French Education and her MA from the University of Michigan in Curriculum Design and Instruction. She is currently Chair of the World Languages Department and senior French language teacher at Mercy High School in Farmington Hills, Michigan. As Department Chair, Joyce leads a vibrant team of language professionals offering French, Spanish, and Latin courses at all levels including Advanced Placement courses. In her role as Mercy teacher for 42 years, she has taught an array of French language and culture courses and also serves as Moderator of the French Honor Society and Co-Moderator of the French Club. In addition, Joyce was formerly an adjunct professor at Mercy College in Detroit and an instructor in adult education evening programs at local colleges. Joyce is known for her innovative programs- including courses on French theater, opera, art and architecture, poetry and literature- and is an advocate for technology in language education and was instrumental in the installation of two language labs at Mercy. 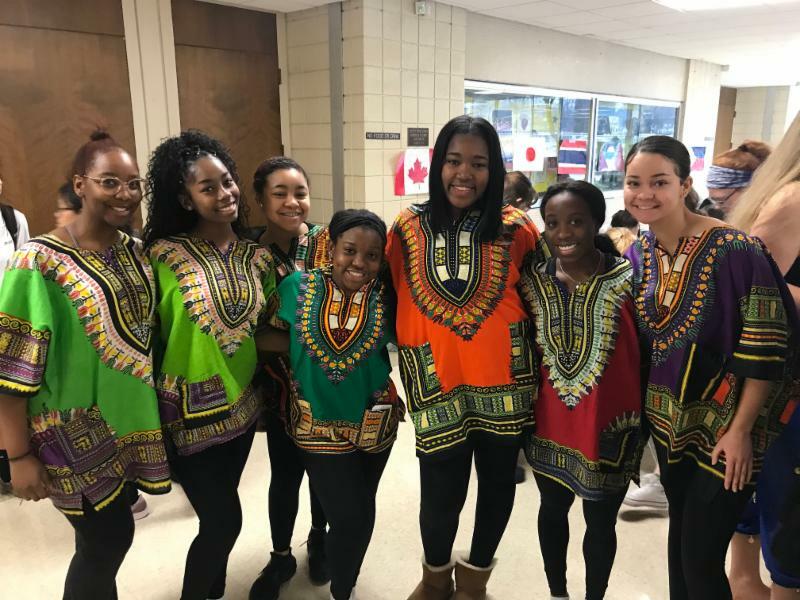 Of particular note is a program she introduced, Passport to France: An Immersion Experience, which proved to be successful in introducing middle chool students to French as well as Mercy High School. She regularly conducts student field trips to special exhibits at the Detroit Institute of Art and local French restaurants, and she celebrates National French Week every year, focusing on a region of the Francophone world with guest speakers and cultural explorations of cuisine, art, cinema, music, and dance. She believes that such experiences contribute to her students' understanding of the local and global influence of French culture. In addition, Joyce is especially recognized for the high academic standards she establishes and the leadership skills she develops among students, many of whom have pursued successful careers in government, the law, business, and education using the French competence they achieved in her programs. Her efforts were recognized in 2009 when she was honored as Mercy High School's Teacher of the Year. Joyce's contributions to the profession include her affiliations with the American Council of Teachers of Foreign Languages, the American Association of Teachers of French, the Oakland World Language Advisory Council, the French Institute Alliance Francaise of Michigan, and, most notably, the Michigan World Language Association. She has presided at sessions and made several presentations at MIWLA meetings on project­ based learning experiences and thematic units of study with a focus on cultural understanding. She was awarded the MIWLA Teacher of the Year Award in 1995 and the Intercultural Student Experiences Language Matters Award in 2009. Finally, Joyce has worked closely with the American Council on International Studies (ACIS) in Paris and the US in coordinating trips for students and adults to all regions of France and other Francophone countries. She also designed and implemented for ACIS a unique immersion program for American students studying French in Paris during the summer. She truly believes that travel and living and studying abroad lead to a greater understanding of other cultures and a greater sense of our shared humanity. MI HEARTSafe School: Mercy has earned certification as an MI HEARTSafe School in recognition of our preparation and readiness for cardiac emergencies, an important achievement to protect the lives of our students, staff and visitors. Our school has 9 American Heart Association Certified Instructors, 83% of our staff (and growing) are CPR certified, a process to provide CPR training to our coaches, 5 strategically placed AEDs, and a Cardiac Emergency Response Plan. 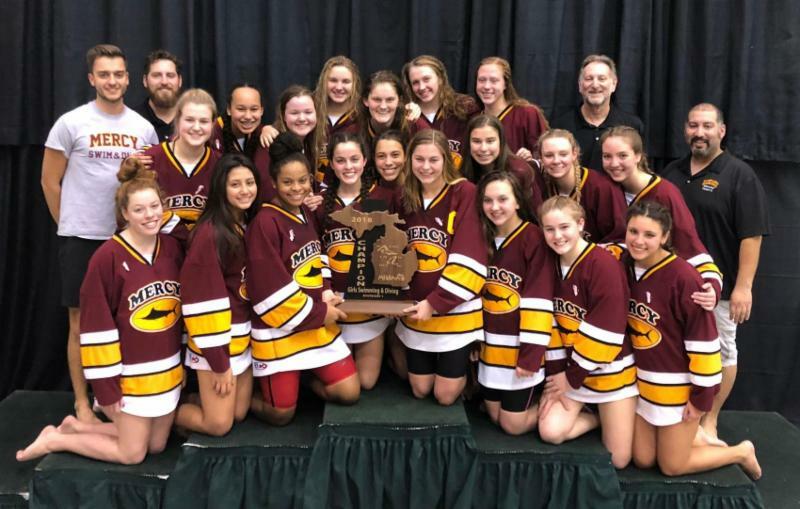 We appreciate our team who has put much effort into this accomplishment, and are very grateful to the partnership we have with the Farmington Hills Fire Department - especially Lt. James Neufeld and Lt. Dan Wecker for all of their support and guidance. AP Scholars 2018 - The AP Scholar Awards recognize high school students who have demonstrated exemplary college-level achievement on AP Exams. Students who receive an average score of at least 3.5 on all AP Exams taken and scores of 3 or higher on five or more of these exams. Students who receive an average score of at least 3.25 on all AP Exams taken and scores of 3 or higher on four or more of these exams. Students who receive scores of 3 or higher on three or more AP Exams. Congratulations to Katie Wildern '19 who won several art awards earlier this summer. She was awarded three 1st place and one 4th place Best In Show drawing awards and earned a prestigious Gold Ribbon Scholarship in July at the Oakland County Fair. As a result, she entered to compete at the Michigan State Fair over Labor Day weekend where she received more accolades including 1st place colored pencil; 1st place digital art; 2nd place pastel; 2nd place charcoal; 2nd place painting; 3rd place pencil and the Michigan State Fair $500 Art Scholarship! CONGRATS to Lily Beasley '20 who won first place in the U.S. National Junior (under 18) Fiddle Championship at the Edinboro Highland Games and Scottish Festival. Shout out to Jess Mruzik '20 Mercy volleyball star and member of the U.S. Girls' Youth National Team who was selected as the Most Valuable Player and Best Spiker in the 2018 NORCECA Girls' U18 Continental Championship. Jess and the U.S. team finished 5-0 and won Gold! Go Jess! Go USA! Plus Jess was named The Detroit News No. 1 area player and congrats to Julia Bishop '21 who claims No. 7.